Beerleaguer was rather harsh in his assessment of the starting lineup the Phillies will be trotting out today, calling it “the worst lineup card in history.” Their performance today didn’t do anything to disprove his assertion. Yes, it truly was awful, but for me the standard by which all bad Phillies team are judged against will be the ’96 squad. It is easily the atrocious Phillies team I’m most familiar with since I actually went to The Vet and Shea Stadium a combined nine times that year to watch it find innovative ways to lose and make me lament that the previous World Series was a scant three years before. With that in mind, I thought I do a quick-and-dirty comparison of today’s lineup to its ’96 counterparts to see which is actually better. 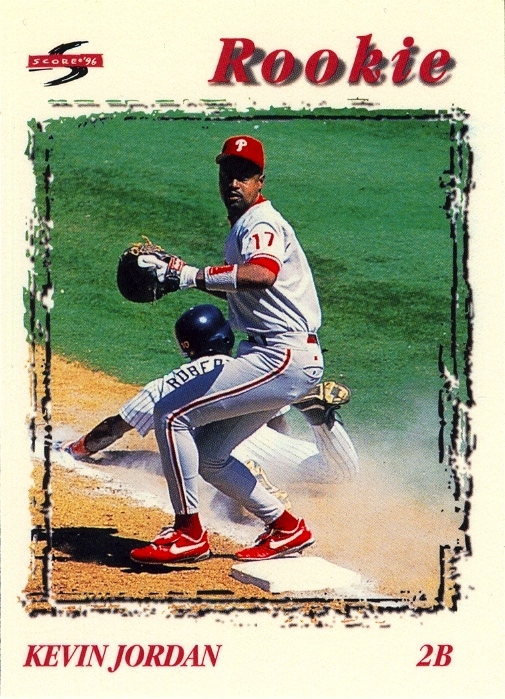 It’s a shame that we’re comparing backups here because I’d like to take a few moments to talk about lucky the Phillies were in their acquisition of Benito Santiago at the beginning of the ’96 campaign. The club decided they wanted a veteran to fill-in while they waited for Lieberthal to mature enough to become the regular starter, and Santiago filled the role admirably, putting up All-Star caliber numbers. He left the team via free agency following the season and Lieberthal became arguably the best catcher in team history. 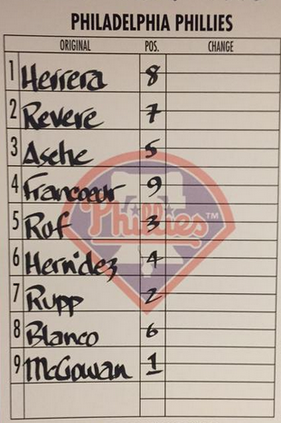 We won’t be saying anything remotely similar about Rupp when he takes over for Carlos Ruiz. At the moment, Ruf is the backup first baseman, so we compare him to Jordan since he started the second most games at the position in ’96. (Interestingly, Jon Zuber and Gene Schall both started nearly as many games at the position as Jordan.) As far as backups go, Jordan actually had a decent season in ’96, providing a 0.5 WAR for the year and an OPS of 93. As much as it pains me to say it, Ruf thus far has been an offensive black hole. In fact, his performance over 15 games in 2015 has eliminated all but 0.1 WAR he accumulated in the first 137 games of his career. Ouch. Finally, a chance to compare starters. At first glance, they couldn’t appear more different. Asche is in just his second full year as a starter while Ziele was a respected veteran playing in his eighth major league season. However, both started the season as placeholders while a highly-regarded prospect gained additional seasoning at AAA. Thus far, Asche has already accumulated 0.5 WAR this season, but it’s unlikely he’ll continue at this torrid pace all year long. However, it’s not a stretch to argue that he could exceed the 1.7 WAR Ziele provided before being traded along with Pete Incaviglia to the Orioles for Calvin Maduro and Garrett Stevenson. Before I tackle this one, I’m glad that thus far Freddy Galvis has proven utterly wrong my assessment of him back on Opening Day. Admittedly, it’s based on a small sample size, but thus far he’s really been a bright spot for the Phillies both on the field at at the plate. I’d love to compare him to Kevin Stocker, but we have another battle of the backups — our fourth out of the five infield positions. I’d like to say I remember something of Mike Benjamin’s ’96 campaign, but I don’t. In fact, I remember nothing at all of him and according to my ticket stubs, I saw him start at short on three different occasions. 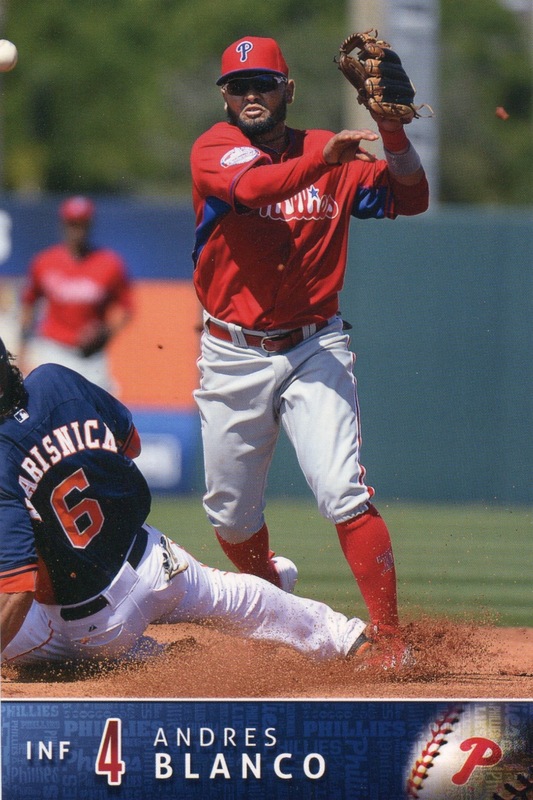 I suspect Blanco’s ’15 season with the Phillies will be just as memorable. Just our second comparison of starters, and this one isn’t even close. In his three seasons with the Phillies, Incaviglia provided 3.0 WAR and an OPS+ of 106. Revere’s Phillies career thus far: 1.3 WAR and an OPS+ of 85, with 60 more plate appearances. Stolen bases and triples can be exciting, but Revere doesn’t provide enough of either to match the excitement of watching Incaviglia absolutely crushing a pitch. Furthermore, as bad as Incaviglia was in the field, Revere really hasn’t been that much better. Admittedly, we’re looking at small samples sizes again, but as the Phillies pointed out on their Twitter feed a couple days ago, Herrera is currently amongst the leaders in several rookie offensive categories. Admittedly, he’s still a work in progress in his transition to the outfield, but he’s quickly proving that the Phillies made the right decision in picking him up in the Rule 5 Draft. Otero, on the other hand, was a passable defensive center fielder, but those skills were completely overshadowed by his offensive deficiencies. I’m not even going to dignify this comparison with commentary. Final score: The ’96 squad exceeds today’s lineup at four positions, with two positions being judged a “push.” With some luck today’s lineup might win in a head-to-head match, but they will need a lot of help from the bench. I don’t know about “worst lineup card in history,” but it definitely looks like it could be the worst in my lifetime. Featured Cards: 1996 Leaf Signature Series Extended Series Autographs (no number), J.R. Phillips; 1996 Emotion-XL #248, Benito Santiago; 1997 Pacific #381, Ricardo Jordan; 1997 Starting Lineup Extended Series (no number), Ricky Bottalico; 1996 Fleer Ultra #517, Toby Borland; 1996 Score #230, Kevin Jordan (UER); 1996 Circa #168, Ricky Otero; 1997 Pacific Prisms Gems of the Diamond #GD-180, Ruben Amaro, Jr.
For the past two years, I’ve been fond of saying, “What happened to the Phillies I spent most of my life rooting for?” It’s meant as a statement of wonderful amazement. For most of my late teen years and adult life, the Phillies were either underachievers (2002-2006) or an awful team (1988-1992, 1994-2000). There was nothing in my life, or Phillies history, to prepare me for the pleasure of seeing the Phillies clinch their 5th straight division title against the Cardinals on Saturday night. As I watched some of the victory celebration on MLB Network, my mind drifted back 15 years, to the 1996 season — a far different time for the Phillies and me. Being a Phillies fan in 1996 was the antithesis of what it means to be a Phillies fan today. Showing up to nine games that season cemented my diehard fan credentials. It’s easy to love a winner. Loving an ugly squad is altogether different. They weren’t just a bad team; they were a bad team fulfilling incredibly low preseason expectations and possessing a barren farm system. In other words, there wasn’t an end to the bad baseball in sight. 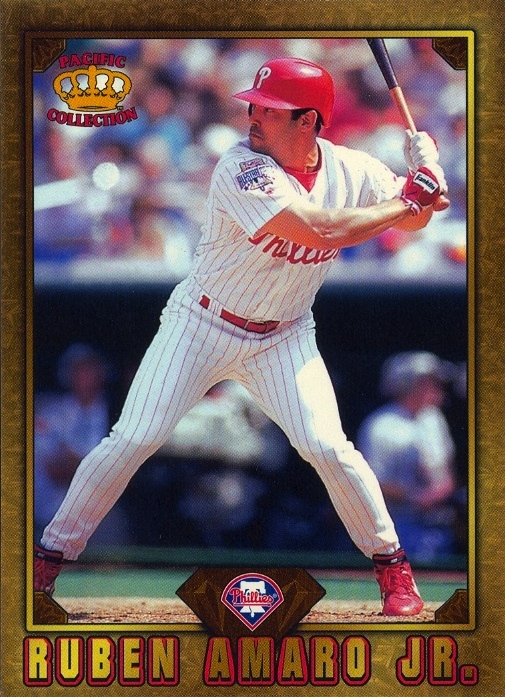 Yes, they had Curt Schilling and Scott Rolen made his Major League debut that year, but this was also a team that was hobbled financially by bad/questionable contracts handed out to Darren Daulton, Lenny Dykstra and Gregg Jefferies. Yes, Mike Grace looked like a legitimate prospect (and he was, before arm injuries derailed him just as they have so many other legitimate pitching prospects throughout history), but management did an incredible disservice by placing Rich Hunter on the opening day roster and letting him start 14 games, even though he had just three starts above A ball in his professional career at that point. Sadly, he would never appear in the majors again, and his professional career ended after the 1999 season, when he was just 24 years old. 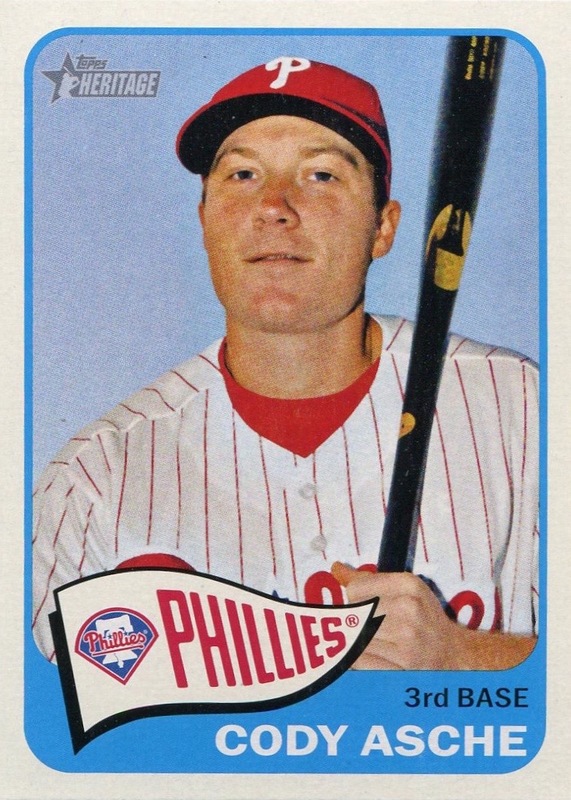 There were a lot of players on the 1996 squad sporting a Phillies career as ephemeral as Hunter’s. Given the team used a franchise record-tying 54 players that season, it’s easy to see how that happened. Mike Benjamin, Glenn Murray, Glenn Dishman, J.R. Phillips, Lee Tinsley, Howard Battle, Ricardo Jordan & Dave Leiper all saw their time in Philly begin and end during that season. 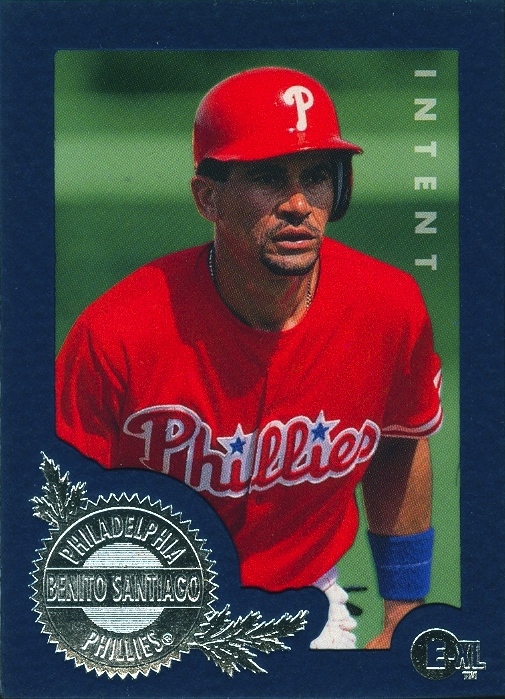 However, Benito Santiago easily eclipsed all of them as the most memorable one-year Phillie on that squad. 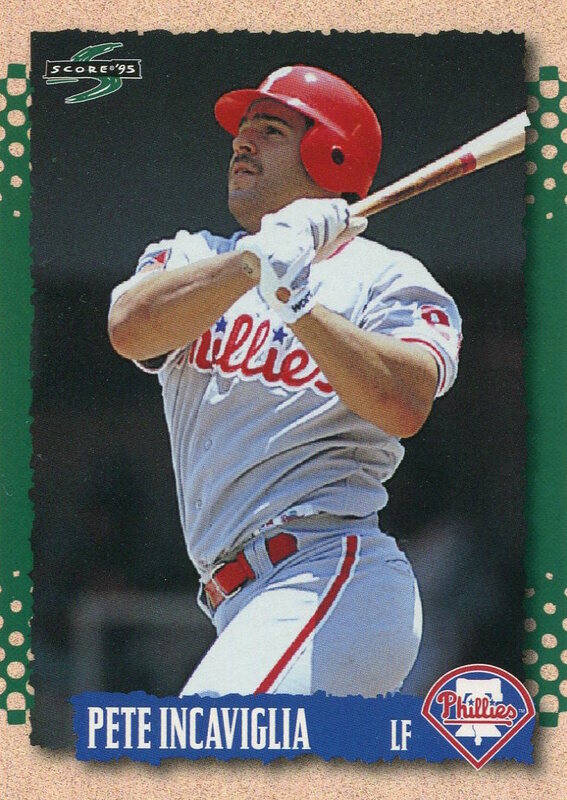 Although the Phillies explicitly signed him with the understanding that he was a just a one-year placeholder while Mike Lieberthal completed his apprenticeship, Santiago’s career-high 31 home runs that season made many Phillie fans to clamor for his return. It’s easy to see in retrospect that the Phillies made he right decision, but at the time there were many who felt that their refusal to resign Santiago was a sign that the front office was trying to run the team on the cheap. 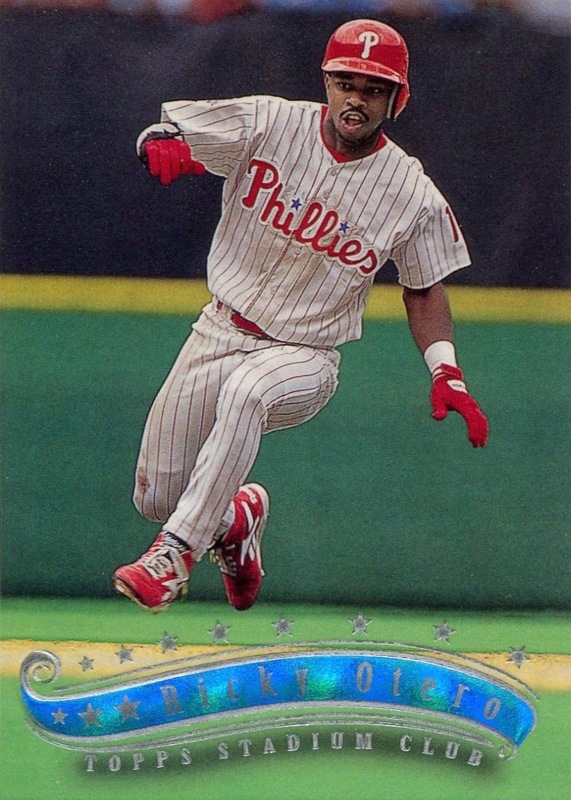 The 1996 season also marked the last time the Phillies hosted the All-Star Game. 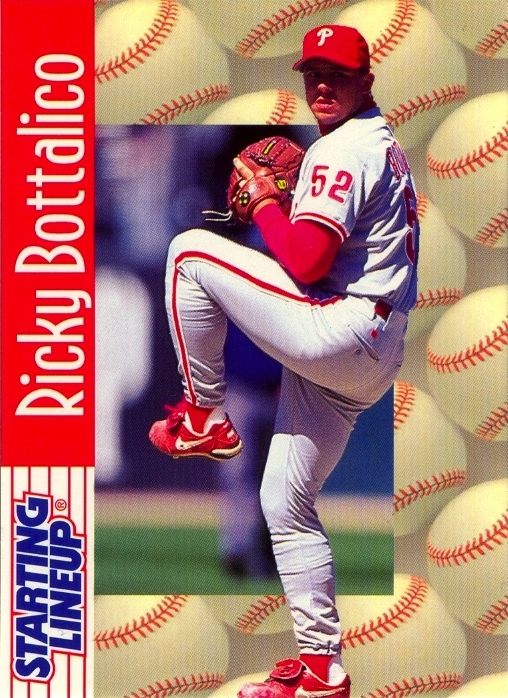 Unfortunately, their lackluster play meant that Ricky Bottalico, in his first season as closer, was their only representative at the game. While it appeared that that season and his selection to the Midsummer Classic meant the fulfillment the organization’s projections of his talent, sadly it was the zenith of his career. 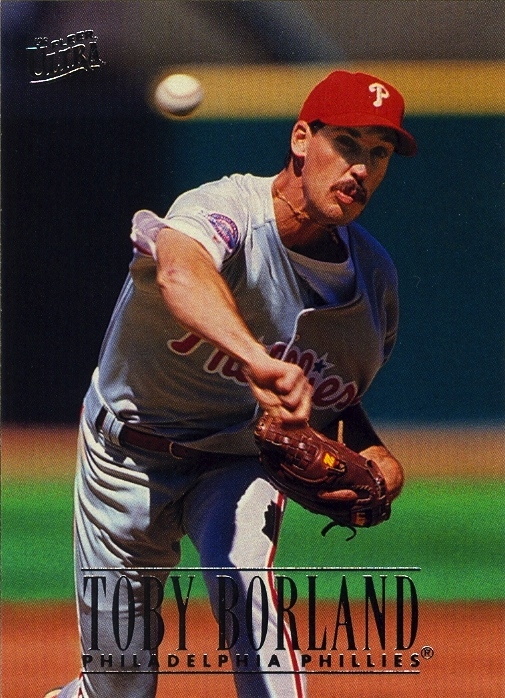 He would play nine more seasons, four of them with the Phillies, and his 1997 campaign was nearly as good as that one, but he really spent the remainder of his career as a journeyman reliever. For me, Bottalico wasn’t the only reliever of note on that squad. That was the season that I started really dreading Toby Borland. 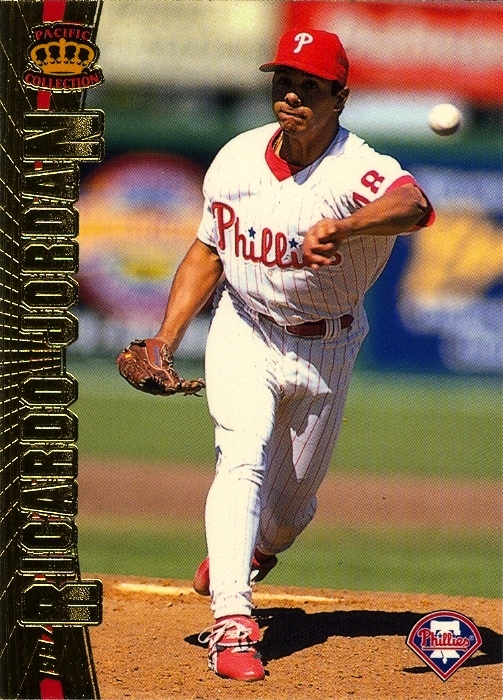 It was probably nothing more than dumb luck and a faulty memory, but it really seemed like that whenever he appeared in a game I was attending, all he did was add fuel to the fire or dig the Phillies deeper in a hole. It’s a nonsensical story, but early that season I started calling him “Mahi-Mahi Man.” I was ecstatic (far more so than when the Phillies signed Cliff Lee this past off-season) when he got traded to the Mets following that season and was even more thrilled when stunk up Shea Stadium for them. You can imagine my surprise then when I checked his Baseball-Reference page explicitly for researching this post and discovered that he actually provided above-average numbers during his Phillies years. Go figure. 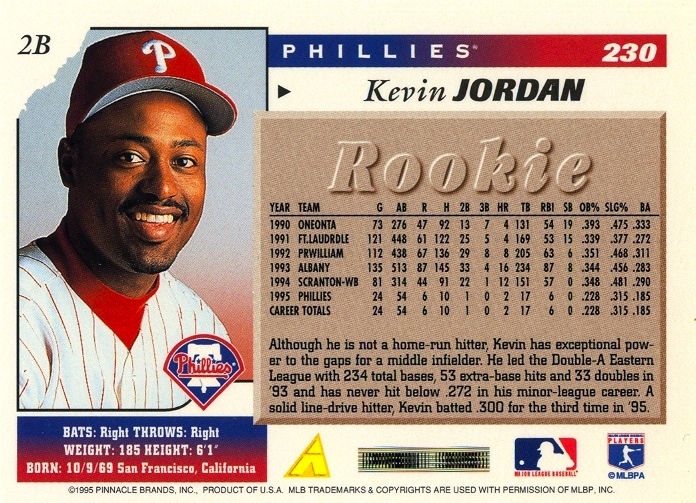 One of the all-time great uncorrected errors on a Phillies card happened that year: Kevin Jordan’s Score rookie card shows Ricky Jordon on both sides of the card. Topps’s 1991 Wes Chamberlain/Louie Meadows error may be more famous because Topps actually corrected it, but Score’s faux pas is really the far more egregious of the two. 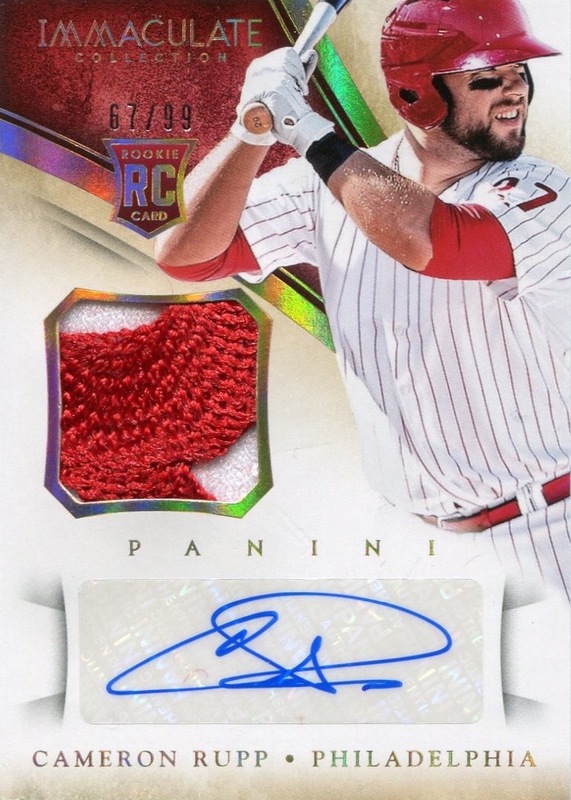 If nothing else, you’d figure that the “2B” position designation on the card and the in-action shot at first base might have raised a red flag to someone in quality control. Because I have all the ticket stubs to the games I attended, I know that I somehow witnessed both of Glenn Murray’s only Major League home runs. I have no recollection of either of them, however. 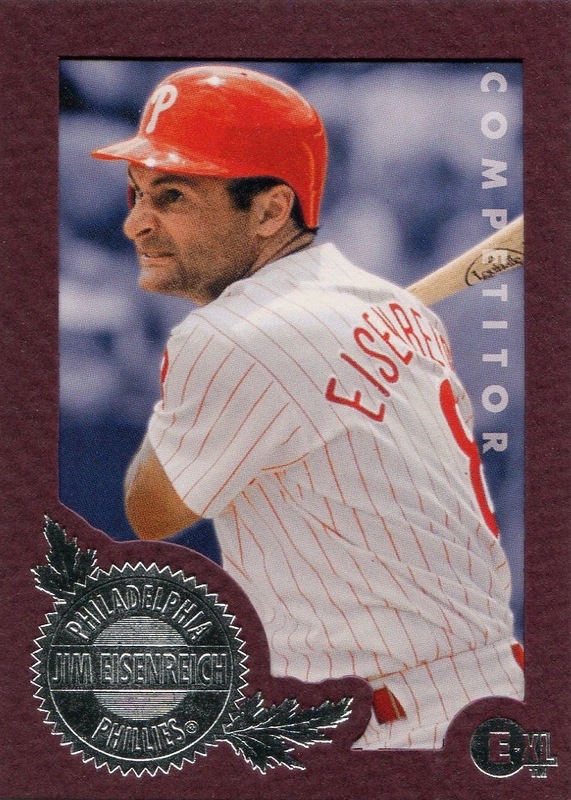 He is one of many to appear with the Phillies that season to not have a Phillies card — not even a team issued one. 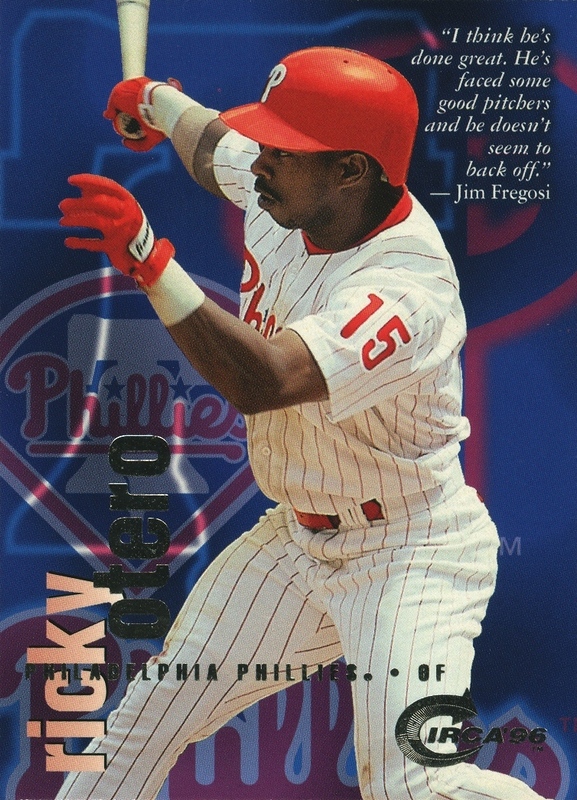 Despite playing in 104 games that year, Ricky Otero appeared as a Phillie in only the Circa set. Even more amazingly, he had an insert card in that set as well. He very likely appeared as an update in the Phillies Team Issue set, but thanks to my move to New York I never had the chance to purchase it, or even know if one was issued. I didn’t see the Phillies win until I went to my fourth game that year. Even then, I had to wait three extra innings to see the win because Bottalico blew the save on a 3-run lead that night. Much to my amazement, the box score shows that Mahi-Mahi Man got the win for that game. I was at the game where Alex Ochoa hit for the cycle against the Phillies. I’ve never been to no-hitter, but I have witnessed a cycle twice (the first being Gregg Jefferies’s the year before). Oh, once again Mahi-Mahi Man provided one very effective inning of work. What the hell? That season marked the first time I saw a Phillies game anywhere other than Veterans Stadium: their season finale at Shea Stadium against the Mets. Pitcher Glenn Dishman made his only start as a member of The Fightins, and Jon Zuber got the start at first. Neither would appear on a card as a Phillie. Poor Rich Hunter made the final appearance of his Major League career — as a pinch runner — and against his former club, Ricky Otero probably had the game of his career. Much to my amazement the box score shows that Mahi-Mahi Man received a Hold despite giving up a run on two hits over 1⅓. Maybe I need to recheck the box score from the games I attended to determine whether I was being unfair to the guy. 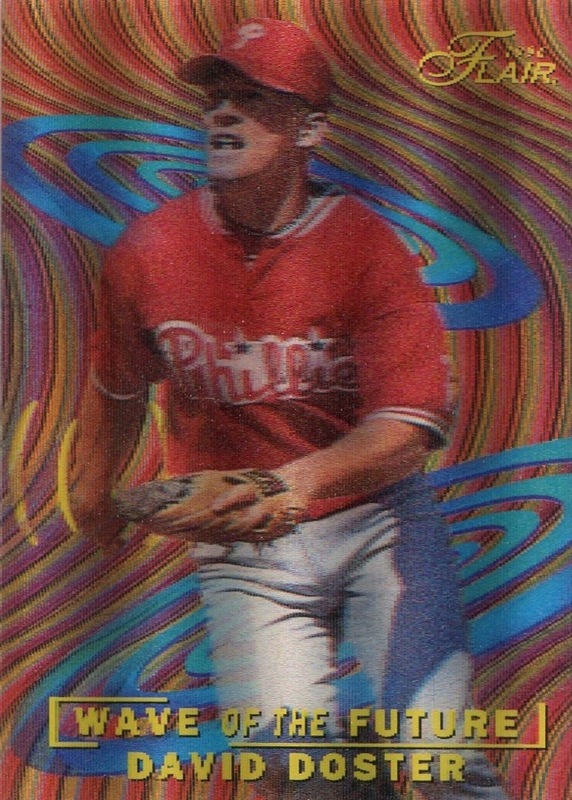 Unlike so many others, J.R. Phillips did appear on a Phillies card that season. 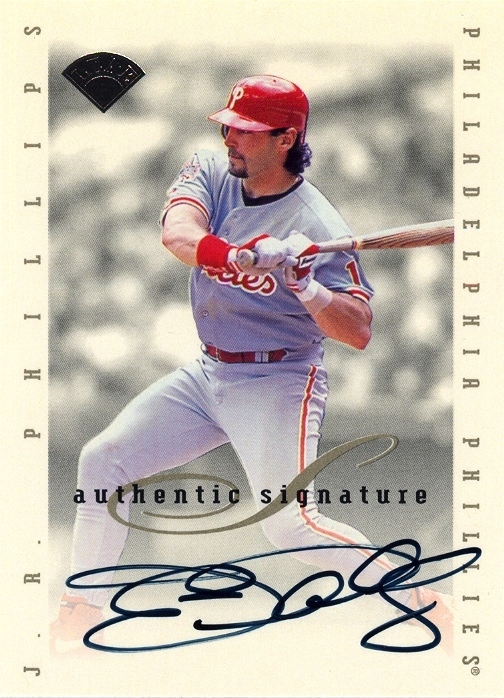 However, it was just one card — the only Phillies card of his career. Interestingly it was an autograph card in the Extended Series of Leaf Signature Series — a set that deserves its own post at some point in the future. 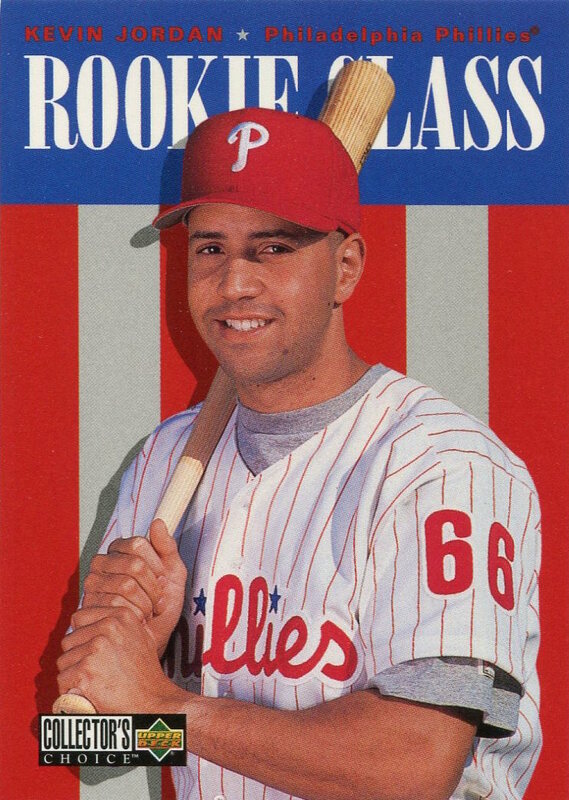 Finally, a certain future Phillies General Manager was a reserve outfielder on that squad, and in the midst of the carnage he put together what was arguably the best season of his career. I’m sure that somehow his experience on the ’96 Phillies contributed to the mental makeup he now demonstrates in the front office. Clearly, this man never wants to witness anything like that season ever again. I don’t think any one can blame him, and Phillies fans today should be all the more thankful that his experiences on that team made him the GM that he is today.